To use the unique Automatic Handheld Dishwasher ，just lock in a plate or bowl, and pull the trigger. Not only does the unique dish washing gadget work on plates and bowls, but you can also stick in silverware into the scrubbers to clean them just as quickly. The dish washing gadget is powered by an internal rechargeable lithium-ion battery with a 1500 mAh capacity that will allow the device to run for 40 minutes straight before having to be recharged. A new dishwashing experience, No need to touch oil. Environmental protection, beauty, simple, good cleaning effect. A robotic arm that automatically cleans the dishes. Whether it is a bowl or a plate can be tightly grasped, easy to complete the clean task. Let the washing dishes become easy to enjoy the process.Come to feel different dishwashing experience. 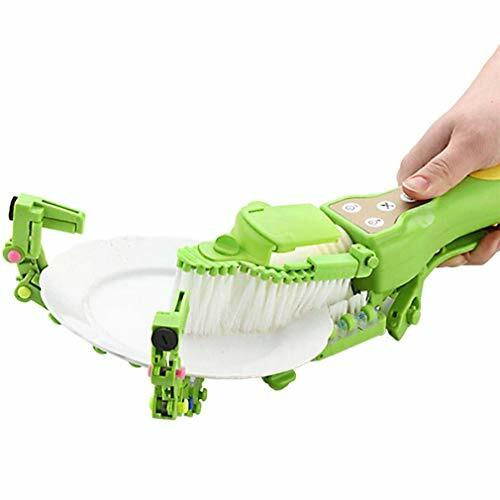 To use the unique handheld automatic dish scrubber just lock in a plate or bowl, and pull the trigger. It \ 'll then spin the dish vigorously around while scrubber drags itself around the dish while it spins. While you do this under hot soapy water, it \ 'll clean the dish in a second or two and you can move onto the next. If you have any questions about this product by SPP PANDA, contact us by completing and submitting the form below. If you are looking for a specif part number, please include it with your message.